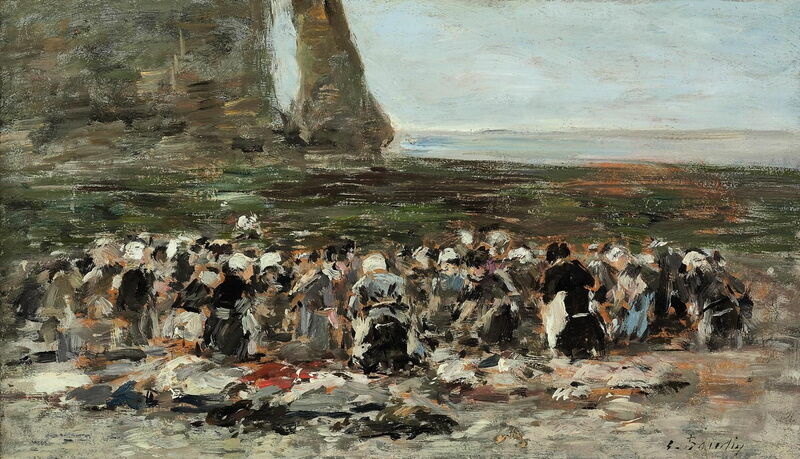 Eugène Boudin (1824–1898), Laundresses on the Beach, Low Tide, Aval Cliff, Étretat (c 1890-94), oil on panel, 20.4 × 34.9 cm, location not known. Wikimedia Commons. When looking at art made more than a few years ago, we need to look at its historical context. Reading a painting in modern terms with 2017 eyes will often lead us astray, to see things which would never have occurred to its creator. Sometimes this is enriching and fun, but more often than not, it leads us to false conclusions. In this article and the next, I am going to consider the case that has been argued in recent years that, in the late nineteenth century, particularly among Impressionists, paintings featuring laundry and laundresses/washerwomen were novel, and have sexual implications. Cast your mind back to the early years of the eighteenth century, when most of the population of Europe lived and worked in survival conditions in the country. Running water was something that came through the roof when it rained, not something which emerged from a tap. Although only the rich could afford to wear clothes for short periods and expect them to be laundered, soiled clothing and linen still had to be washed – in the nearest outdoor body of water. Pierre-Salomon Domenchin de Chavanne (1673–1744), Landscape with Washerwomen (date not known), oil on canvas, dimensions not known, Musée des Beaux-Arts, Rennes, France. Image by Caroline Léna Becker, via Wikimedia Commons. 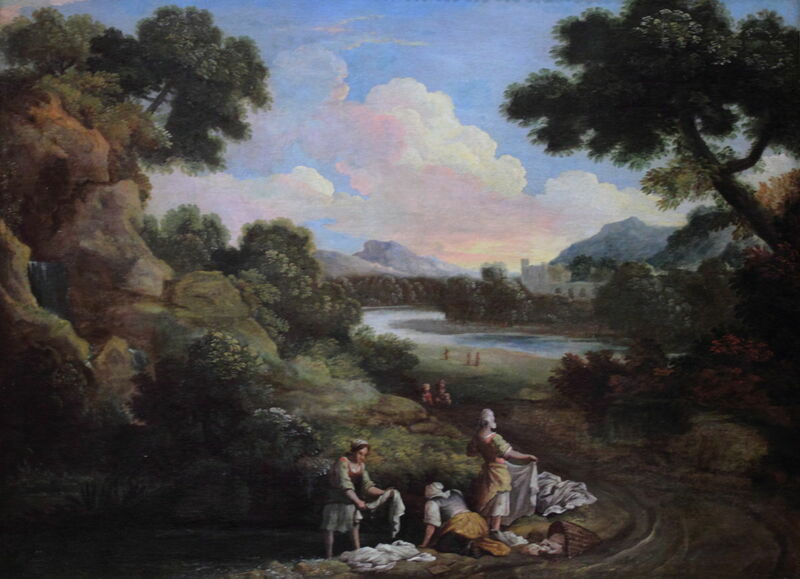 Pierre-Salomon Domenchin de Chavanne’s Landscape with Washerwomen, probably from around 1700-20, shows a common sight, as do many early landscapes: a small group of women have taken sheets and clothes to a small lake, and are washing them as well as they can. As an everyday event, it is hardly unusual. Alessandro Magnasco (1667–1749), Landscape with Washerwomen (1710-20), oil on canvas, 73.2 x 57.8 cm, Museum of Fine Arts, Houston, TX. Wikimedia Commons. 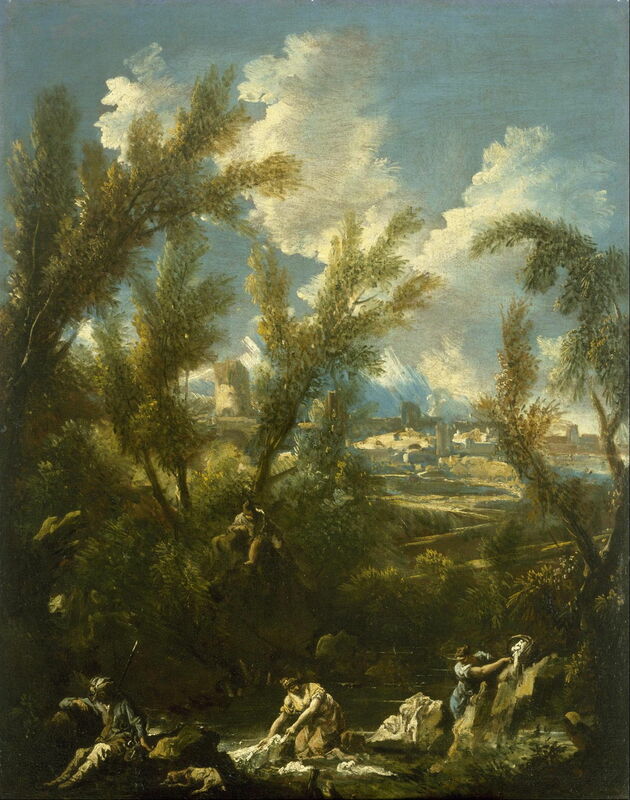 Alessandro Magnasco’s Landscape with Washerwomen (1710-20) shows a similar scene. At the lower left is a man out hunting with his dog and gun. The figures provide some interesting foreground detail, no more. 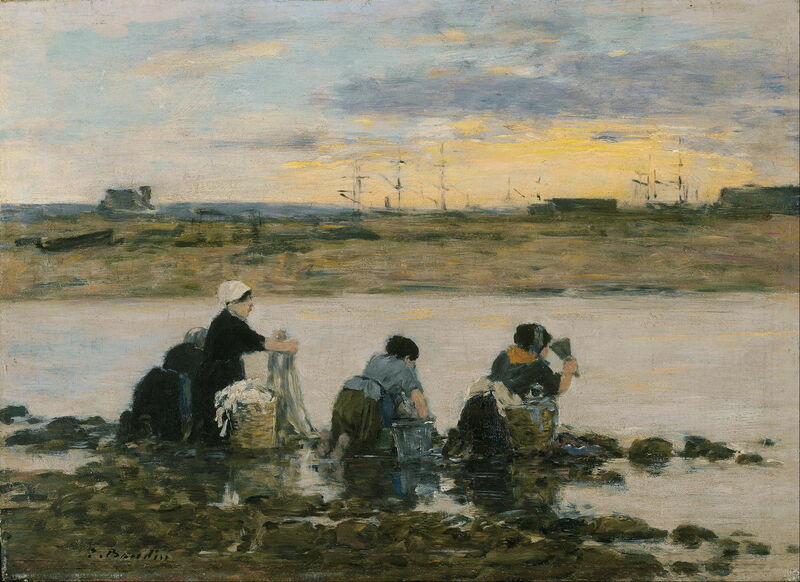 Martín Rico (1833–1908), Washerwomen of Varenne (1865), oil on canvas, 85 x 160 cm, location not known. Wikimedia Commons. By the nineteenth century, with the growth of towns and cities, the laundry became more organised, as shown in Martín Rico’s Washerwomen of Varenne (1865). A group of fifteen women, some with babies and children, are on the bank of the local river, most of them probably performing this as a commercial service – one of the few occupations open to women of the lower classes. For Rico they transform his landscape with their activity and the rhythm of their figures. Berthe Morisot (1841–1895), Hanging the Laundry out to Dry (1875), oil on canvas, 33 × 40.6 cm, The National Gallery of Art, Washington, DC. Wikimedia Commons. 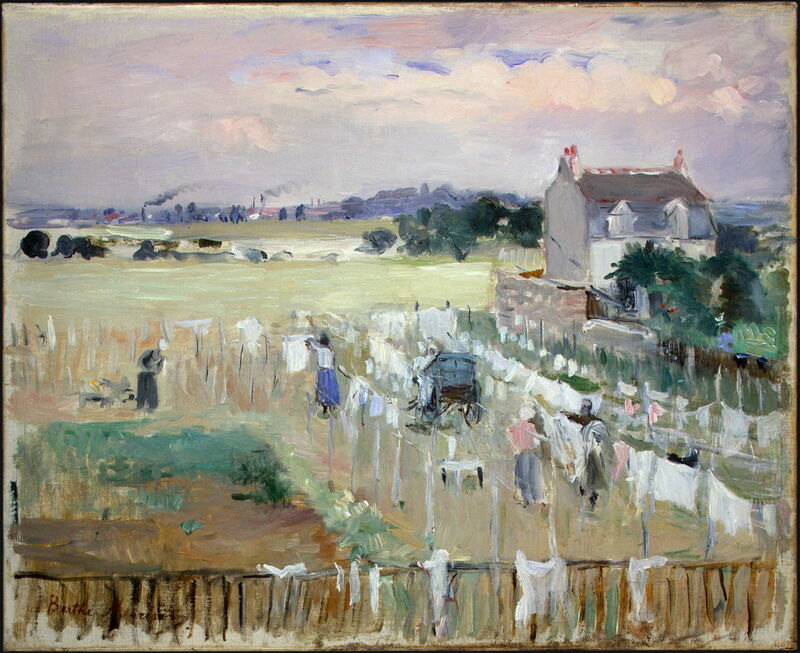 In the early years of the Impressionist movement, Berthe Morisot’s Hanging the Laundry out to Dry (1875) shows a communal drying area at the edge of a town. The women have a large black cart which they use to transport the washing, and are busy putting it out on the lines to dry in the sunny spells. Next to that area is a small allotment in which a man is growing vegetables, and in the distance are the chimneys of the city. 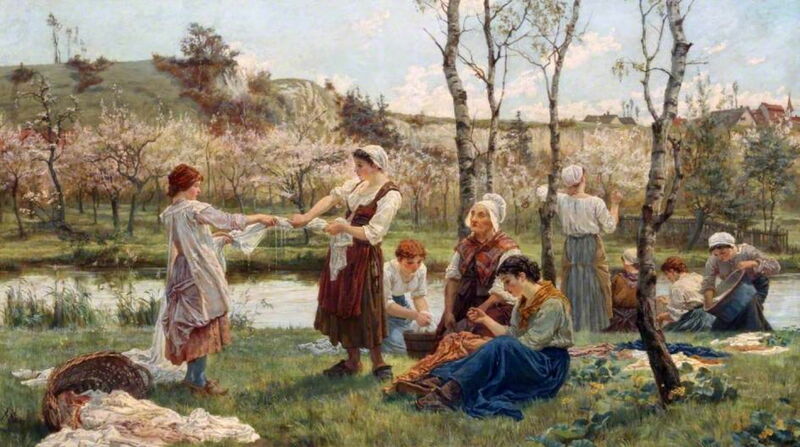 Alice Havers (1850–1890), Washerwomen (date not known), oil, dimensions not known, Walker Art Gallery, Liverpool, England. Wikimedia Commons. Alice Havers’ Washerwomen, which given her tragically brief life must have been painted around 1880, shows a wide range of ages, working together, some repairing the clothes, others talking. On the other side of the river, the fruit trees are in blossom. 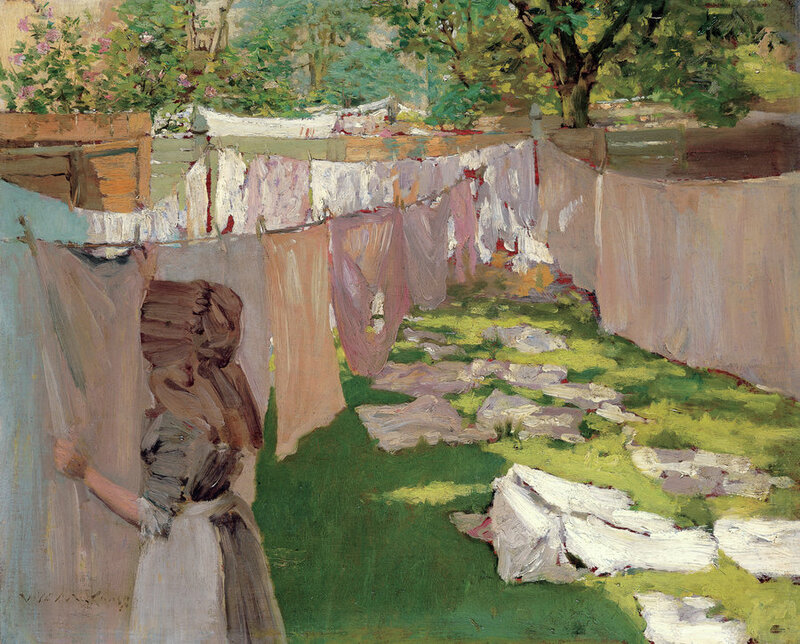 After William Merritt Chase moved into his first family home in Brooklyn, he painted Washing Day – A Backyard Reminiscence of Brooklyn (c 1887). With the sun out, every available space in the backyards has been filled with drying washing, either hanging on lines or laid out on the grass. Eugène Boudin (1824–1898), Washerwomen by the River (c 1880-85), oil on panel, 26.2 × 36.2 cm, Israel Museum מוזיאון ישראל, Jerusalem, Israel. Wikimedia Commons. Although I cannot see any early paintings by Eugène Boudin which are as illustrative of this theme, later in his career he painted Washerwomen by the River (c 1880-85), above, and Laundresses on the Beach, Low Tide, Aval Cliff, Étretat (c 1890-94), below. The latter painting is remarkable for its rough facture, and for the number of women gathered by one of the most recognisable landmarks on the Normandy coast, the arch of Étretat. Paul Gauguin (1848–1903), Washerwomen of Arles I (1888), oil on canvas, 75.9 x 92.1 cm, The Museum of Modern Art, New York, NY. Wikimedia Commons. 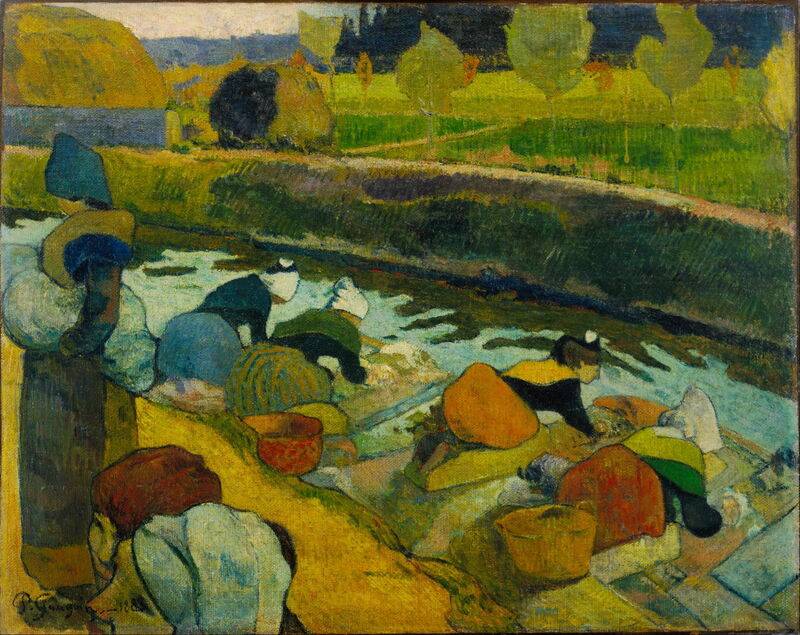 Both Vincent van Gogh, in some of his paintings of the bridge of Langlois at Arles from 1888, and Paul Gauguin, in his Washerwomen of Arles I (1888), above, showed the women hard at work. Pierre-Auguste Renoir (1841–1919), The Laundress (1891), oil on canvas, 46 × 56 cm, Private collection. Wikimedia Commons. 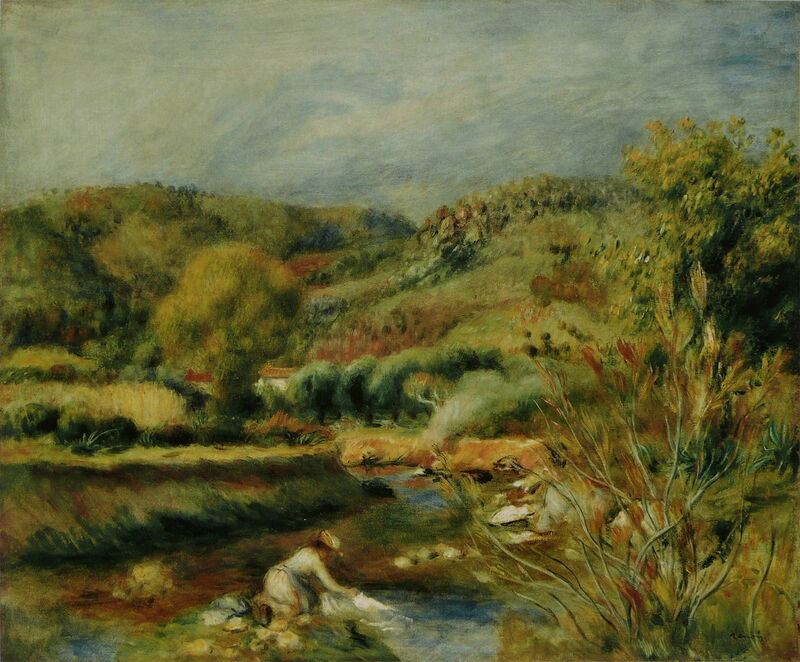 Pierre-Auguste Renoir’s The Laundress (1891) sets a single, quite well-dressed woman doing her washing in one of his sumptuously soft-focus landscapes. Jahn Ekenæs (1847–1920), Women Doing Laundry Through a Hole in the Ice (1891), oil on canvas, 67 × 108 cm, Private collection. Wikimedia Commons. 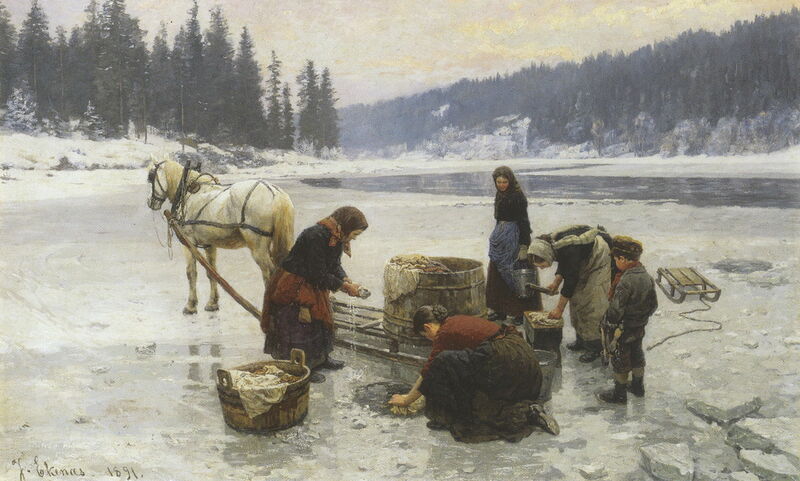 The Norwegian painter Jahn Ekenæs teaches us that, even in the bitter Nordic winters, the washing still had to be done: his Women Doing Laundry Through a Hole in the Ice (1891) seem to have the toughest job of all. Note that only one of the women is wearing anything on her hands. A century later and they would have found this task much harder: many lakes like this are now used for hydro-electric purposes, and during the winter the water level below the ice can fall greatly. Peder Mørk Mønsted (1859–1941), Laundry Day (1899), oil on canvas, 24.5 × 16.5 cm, location not known. Wikimedia Commons. Peder Mørk Mønsted’s Laundry Day (1899) shows kinder conditions during the summer, when doing the washing would surely have been a more popular task. Laundry Day (c 1880-1910) is a brilliantly loose oil sketch by Francisco Pradilla Ortiz showing five women busy with their washing. At the right is a donkey (or similar) to carry the load back. Manuel Garcia y Rodriguez (1863–1925), White and Black. Andalucian Landscape. 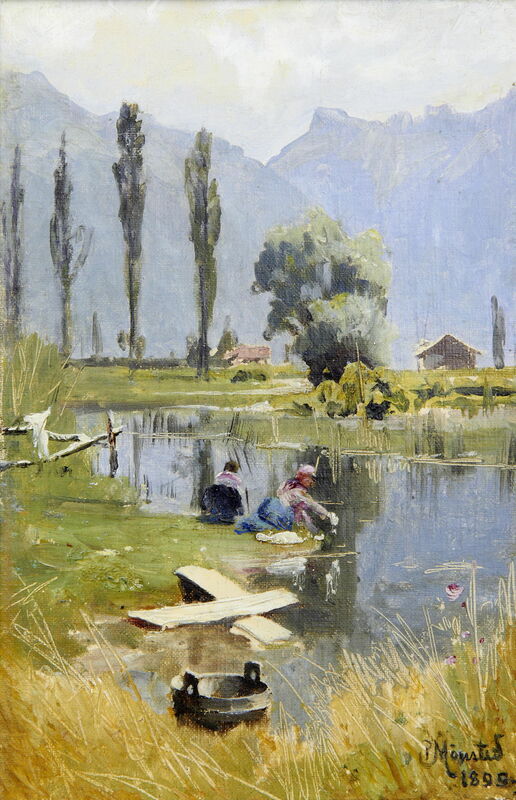 Laundresses in the River Guadaíra (1903), further details not known. Wikimedia Commons. In common with many of these paintings, Manuel Garcia y Rodriguez uses the white of the linen heightened in sunshine to generate contrast, in his White and Black. Andalucian Landscape. 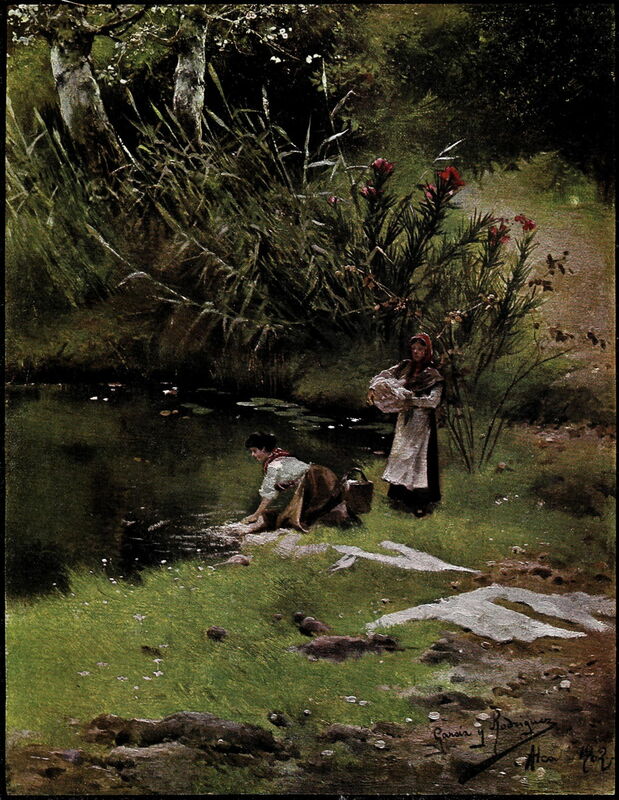 Laundresses in the River Guadaíra (1903). I hope that this demonstrates that late nineteenth century painters, particularly Impressionists, were by no means exceptional in showing laundering and laundresses in their landscapes. In the next article, I will look at figurative paintings of laundresses/washerwomen themselves, and some of the readings which are made of them. Posted in General, Life, Painting and tagged Boudin, Chase, Ekenæs, Garcia, Gauguin, landscape, Magnasco, Mønsted, Morisot, Ortiz, painting, Renoir, Rico. Bookmark the permalink.